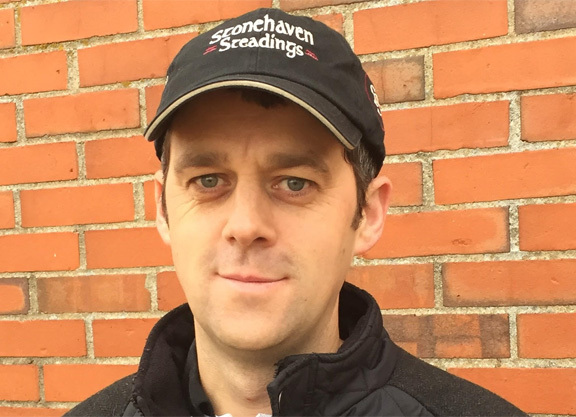 Aidan O’Meara, who served as Stallion Division Manager at Hill ‘n’ Dale for the last two decades, announced last week he will be joining Stonehaven Steadings as Director of Bloodstock and Client Development. The farm, located at the intersection of Old Frankfort Pike and Paynes Depot Road, is owned by Chiquita and Jeff Reddoch. O’Meara graduated from the University of Limerick with a degree in Equine Science and Business management and is a recent T.I.E.A leadership award finalist. He is married to the Reddochs’ daughter Leah and the couple has three children. O’Meara recently sat down with the TDN to discuss his time at Hill ‘n’ Dale and the plans for Stonehaven Steadings. TDN: Can you give us a little background on how you first became involved in racing? AM: I gained my early equine education in the sport horse world back home in Ireland and as a kid grew up riding fox hunters and show jumpers. When I started my degree in Equine Science, I switched over to riding and schooling steeplechasers and this is when my interest in Thoroughbred racing was really fostered. During my second year at college we had an opportunity to travel to Kentucky on an internship and I jumped at the chance. I loved it over here and decided to return full time after I graduated. I wanted to step up to the next level in my horsemanship and to me, managing stallions was one of the more challenging things to do to achieve that goal. TDN: What accomplishments are you most proud of from your time at Hill ‘n’ Dale? AM: When I started at Hill ‘n’ Dale, we had two modest stallions and over the years I was fortunate enough to manage an operation anyone in the world would be proud of with industry-leading stallions Curlin and Kitten’s Joy now at the helm. I am very proud to have been able to play a role in that success and, in part, the careers of top dirt sires Medaglia d’Oro and Candy Ride, as well, back in the day. Premium care of the horse has always been my greatest passion; nurturing Seattle Slew through the final days of his life is something I will forever cherish. Something else I’m very proud of was our role in promoting the industry at large. Thousands of visitors passed through the gates of the stallion barn over the years and we tried to make their visit a memorable one. I like to think we played a little part in making a new fan or owner in the industry or helped inspire some of the young students who passed through to partake in the industry as a full-time professional. 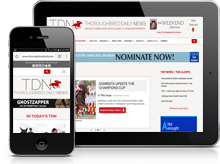 TDN: What key lessons are you taking away from your time at Hill ‘n’ Dale? AM: I had the good fortune to be able to witness Hill ‘n’ Dale’s ascension into the powerhouse it is today first hand and I am very proud to have been part of the team. I was exposed to all aspects of the industry beyond my primary role as Stallion Division Manager, be it broodmare management, sales, bloodstock which has proved to be a great foundation for this next step in my career. Passion and dedication for the business are first and foremost and attention to detail in everything you do on the farm is vital for producing top-class commercial stock. An honest straightforward approach with your clients is very important, as is looking after your key employees. Retaining a top-class team is essential in executing your long-term plans. I have learned what works best, having been focusing on pedigrees, matings and physicals, along with perfecting the raising and prepping of a top-class Thoroughbred over the last 20 years. TDN: What goals, both short term and long term, are you setting for Stonehaven Steadings? AM: Short-term goals for the farm are to fully maximize the facilities and stock that we currently have. I’m a horseman at my core and will have a strong daily hands-on presence at the farming, alongside our long-time farm manager Colby Marks. We look to take on select number of boarders and purchase a number of mares for our own broodmare band. This area is a hot-bed for raising significant racehorses with WinStar and Three Chimneys close by. Our own property is already responsible for producing five champions in the last three decades and under our banner, (they have) produced Shanghai Bobby and Daredevil, both exciting young stallion prospects standing here in Kentucky. Our best group of weanlings to date, which will be offered at auction next year, are by Empire Maker, Speightstown, Malibu Moon, Uncle Mo, American Pharoah, to name a few, and we will fully maximize their potential. Stonehaven has had some significant success with our stock over the last couple of years with four ‘top 5 session toppers’ at Keeneland September and yearlings selling for $500,000, $460,000 and $360,000, etc. Each year we have improved and look to continue that upward trajectory. Long-term goals are to further develop our broodmare band by adding higher-end mares through partnerships and foal sharing on high-quality individuals. We intend to fill the farm with top-tier horses, to fully maximize a location that’s proven to produce some of the best. We will look to develop a pinhooking venture and, concurrent with that, expand our sales consignment. We will also look to build our racing stable and 2-year-old program. Adding to this year’s roster is the half-brother by Medaglia d’Oro to Shanghai Bobby. He has really come into his own and matured well and we are excited about his prospects. We’ve retained a Tiznow yearling filly from the same family who looks to be precocious, as well. TDN: Are you looking forward to working with family? Do you see any challenges or extra rewards? AM: I’m really looking forward to working with my family on a full-term basis. My wife Leah and I have great dynamic. She has done a wonderful job the last few years and balances her responsibilities impressively with her role as mother to our three young children. Jeff and Chiquita are wonderful, down-to-earth people. They have come into this business from the oil field industry and there are many similarities between the two. The oilfield can be an all-or-nothing type of situation, similar to raising bloodstock, so they have a great understanding and acceptance when difficult issues arise. Like all businesses, there is a little different dynamic involved when it’s a family operation and no doubt there will be challenges associated with that here and there, but working with family and building up something that can be passed generation to generation I think is one of the most satisfying things that you can do from a professional standpoint.